Last weekend the weather was beautiful and the temperature mild here in Oklahoma. The winds have been fierce on and off for the last week and a half, so the greenhouse structure I was using as a mock tool shed was seeing some bad wear and tear. Sucking it up, I got up early last Saturday and tackled cleaning out the storage barn, organizing and culling the "stuff," and moving all the tools in out of potential weather exposure. The project took all day and boy my knees hurt like heck for the effort. First we hauled out all of the boxes that needed sorted. Into the loft on one side went all the holiday decorating supplies. We moved all the unused furniture and various household goods I am not parting with (someday they will go in a guest cottage) into the far recesses of the loft, before lining up the boxes for the holidays close to the edge for ease of access. A large pile for donating began to form. I moved all the canning jars to the back corner of the barn for now. Eventually I want to add more shelving to the barn and neatly store the jars by size and wide-mouth vs narrow. However, for now they are stacked neatly all in one area. I decided to leave all my craft project totes stored on that side in front of the jars for now because I want to be able to access them easily as the mood hits to complete the multiple quilts I have started. Toward the front of the barn on the right side I kept a portable closet to store out-of-season clothing. An antique dresser fills the space between the boxes and the portable closet. 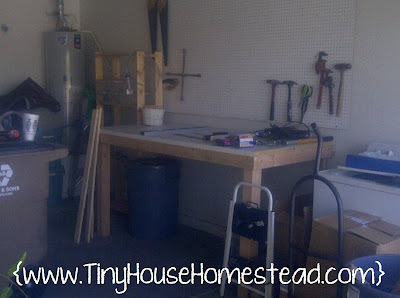 I will build a workbench like I built in my garage in my "big house." On the left side, we moved in the frame to the greenhouse with its great shelves, sans the plastic cover. 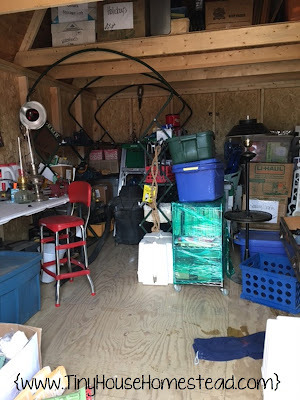 This created a great tool storage area. This took up roughly one quarter of the barn, but greatly increased the storage area and efficiency of accessing tools. I added a folding table in front along the left side as a tool bench until I find an old door to build a more formal and solid tool bench. Finally I brought in larger tools such as the saw table and shop vac. 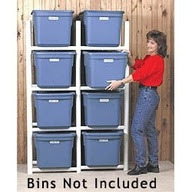 All in all, it is a pleasure now to be able to access things I don't want to store inside the Shouse or Shedroom. I am able to locate and use the things I choose to store. All my things are protected from weather and the locking barn door helps keep everything secure. It was a Saturday well spent!